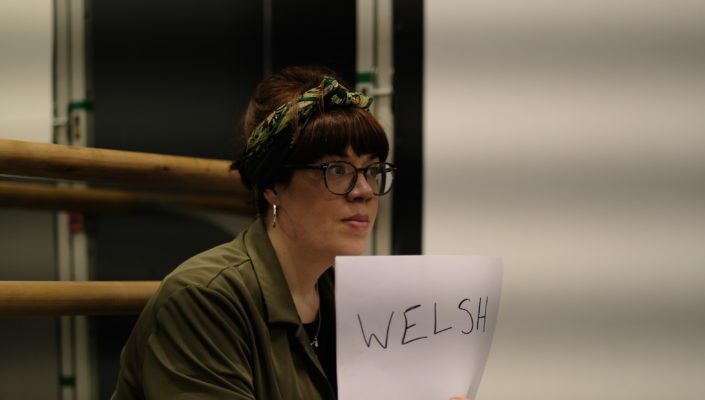 Theatre Director Chelsey Gillard shares some interesting thoughts about communication adjustments during the rehearsals, and their echo outside the ENGLISH rehearsal room. Our performer Jonny relies on lip-reading to communicate. He is profoundly deaf and his hearing aids act only to amplify sounds – they do nothing to differentiate the noises he hears. At first I was hyper aware of which way I was facing when I spoke in the room; could Jonny see me, was the light on my face, was anyone else trying to speak at the same time? I was self-conscious and really aware of how my mouth was moving. I began to worry that my childhood lisp would make a reappearance if I concentrated on my speech too much. I was reminded of how I would always begrudgingly play the narrator in the school nativity because my voice was loud and clear (although I was never to land the lead role of Mary, I did once proudly play a punk in an assembly about alien bumblebees!). Now I feel strange if I’m not looking directly at someone when I speak to them. Out and about, in my daily life outside rehearsal I worry people can’t hear me if I don’t have direct eye contact. I like it this way. I feel more connected. There is less room for misunderstanding and miscommunication. You can tell so much more by looking someone in the face as you speak to them, things that words and tone can’t always convey.